Chris' interests are Baseball from 1970 until the present. He also collects Football cards. collecting as a kid. In addition, Boone is interested in completing Topps 1956 -"the best vintage card ever". He has a wide variety of baseball and football cards to trade. Boone also has several starter sets to trade. author of Ball Four, as well as some newer Topps baseball card series. issues. Any condition is fine for most sets. Andy's main collection is sports pocket schedules. issues from the 1960's as well. He has a vast array of cards to trade in his doublesbox. good. If an issue is not listed on Jim's wantlist - let him know. He'd probably be happy to add it to the list. cards from 1959 to current to trade. Ken is a collector of baseball currently with wants from 1965-1971 & 1974-80. Football from 1961-1985.
with Bucks, Packers, Eagles, Brewers, Badgers on the covers. football and basketball sets. John collects cards in ANY condition. complete during his childhood. He is especially interested in any Giant cards be it San Francisco. James is currently working on a Topps baseball set run from 1964-1972. He likes 1956 and 1960 some 60s Football and non sports cards and any cards with Sandy Koufax on them.Sets vary in condition requirements but most are VG-EX. James is not too particular about centering or sharp corners. He prefers cards to becrease free unless otherwise noted. of his completed '73-76 sets. He is always happy to take earlier cards especially Hall of Famers in any shape. memorabilia that may be of interest to particular collecters that he's thrown into trades. 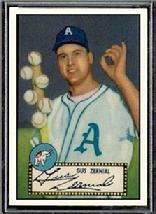 Len collects Topps Baseball from 1952-57 and as well as some Fleer and Leaf sets.. He is also working on Topps Football sets from 1958-1968 + and Topps All-Star Rookie Trophy cards. He also has added the 1964 Beatles set . Len collects Topps Heritage and Topps Red Sox and Patriots cards as well. John collects Baseball, he wants every is Braves baseball card/coin from 1887-current. He also collects the main flagship sets from Topps,Fleer,Donruss,Upper Deck,Bowman,Score,Pinnacle as well as Stadium Club,Ultra and a few more. He collect Kelloggs,Hostess,Post and the T206 White Border set. John collecte vintage Wacky Packs too! Lots to trade from non-sports to all sports vintage to UV alike. complete every set back to 1960. He is also a big New York Mets fan. requirements are listed with each set. Kelloggs, and specific modern sets makes him happy too. As a wise man once said "Keep trading fun". older sets) and is ever so slowly working his way back into the dawn of card collecting. Chuck's main collecting interests are Topps Baseball and some vintage Football. Tim is currently working on sets from the 1970's and 80's. He also collects newer issues from the 1990's as well as 2000 cards and team sets from the Minnesota Twins and Vikings. of the newer issues. He also collects packs,wrappers and inserts. Kevin is in the process of putting together vintage Baseball sets and is currently working on 1960 's and 1970's. He is also working on a few early Fleer, Leaf and Kelloggs Baseball sets and the 1972 Topps Football set. He is a big San Francisco Giants fan.